I believe that students need to take responsibility for their own learning. Using being absent as an excuse simply doesn't fly. It wouldn't work in the real world and it shouldn't work in the classroom. Just because you're absent doesn't mean you have an excuse for not handing in your homework or not knowing about a test. If you were absent from your job and you missed a meeting you'd still be responsible for knowing what happened during that meeting. There are a couple ways you could help students take responsibility for knowing what happened in class when they were absent. You could create a box and have folders for each day of class. Inside you could put the lesson plan and any supplemental material you used. You might want to write the name of the student on each paper. This is more work for you, but you can see who took the papers and who didn't. You could also have the students get the names and numbers of classmates and tell them they are responsible for calling them and finding out what happened in class. 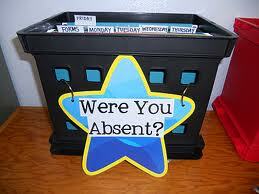 You could have a sign-up sheet where the student would come and talk to you and ask what they missed in class. If they talked to you, they would write down the date they were absent and sign their name. Whatever you do I think it's important that you tell the student it's their responsibility to find out what happened in class. When teachers are having upwards of 100 students they simply can't go chasing every absent student down. Also make sure they know what you expect of them. If they're absent one day would they get an extra day to do homework and an extra day to study for the test? It's up to you, but make sure you write it down in your syllabus.